You know these "good" types of bacteria help with digestion. Now, discover delicious ways to incorporate them into your diet. 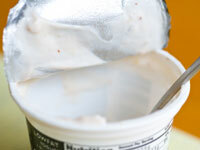 Q: I know probiotics are the good bacteria in yogurt. What are prebiotics? • Naked Juice’s Tropical Probiotic Smoothie ($2.99 for a 10-ounce bottle) has 180 calories, two servings of fruit, and live, active cultures. Its mango-banana flavor is a perfect morning refresher.